October 2012′ s Superstorm Sandy marked a turning point in awareness of the threats of climate change-related coastal flooding. Since then, Boston Harbor Now has led efforts to understand Boston’s risks from sea level rise and opportunities to solve other pressing concerns as we protect the city from flood damage. These maps were created for the Central Artery/ Tunnel (CA/T) Vulnerability and Adaptation Assessment, completed in June 2015 for the Massachusetts Department of Transportation. 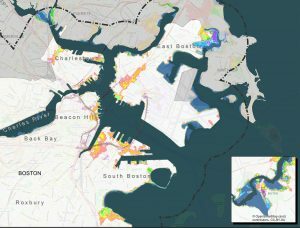 They represent the same data, flood model and scientific team as involved in the Climate Ready Boston maps, but include more site-specific details. 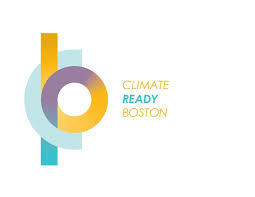 Boston’s climate preparedness was substantially advanced through collaboration among the City of Boston, local foundations and UMass Boston that resulted in the release of Climate Ready Boston in 2016. Climate Ready Boston uses cutting edge research and modeling to provide the City with the information needed to develop consensus climate projections, a city-wide vulnerability assessment and proposed next steps. Boston Harbor Now staff frequently give media interviews and public presentations on how sea level rise is projected to affect Boston and solutions other cities are using to increase livability and decrease flood damage risks.